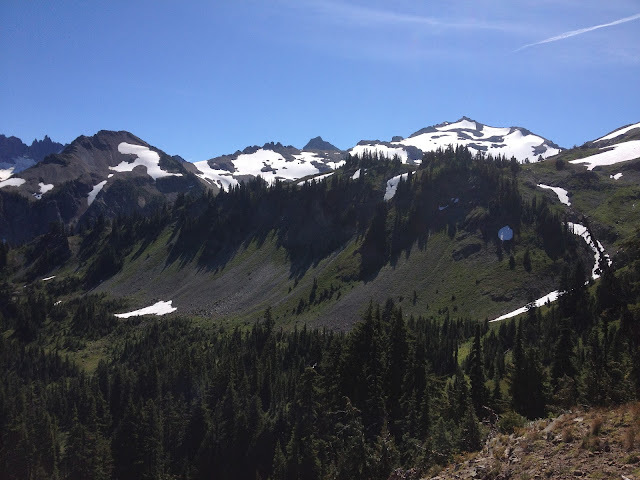 From Walupt Creek (Mile 2277) to White Pass (2303). Sean-o here. Woke up cold and wet and had to hike it off. 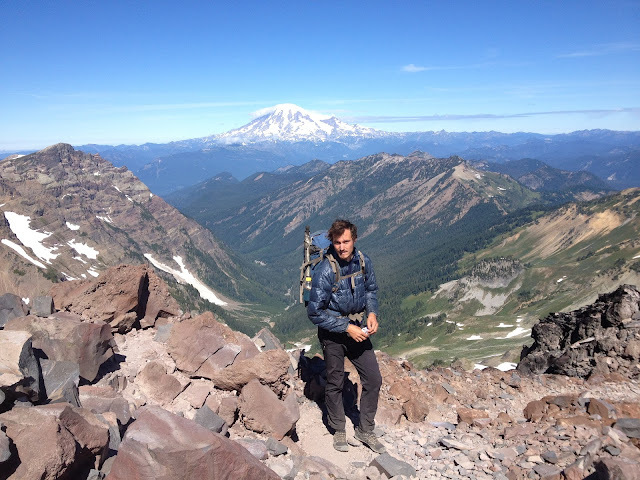 But the experience of the Goat Rocks Wilderness made it all worth it. With Rainier, Adams, and Mt. St. Helen's as the backdrops, we hiked into one of the most stunning valleys of the trip. 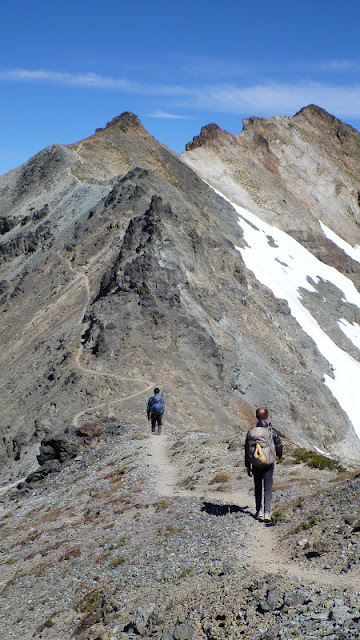 It wasn't surprising that there were dozens of dayhikers and weekend packers moving along the various trails that move up and down the slopes and onto the peaks. It was just one "Wow!" after another. Mt. St. Helens off to the west-southwest. That's our trail running down through blooming alpine terrain. So lovely! 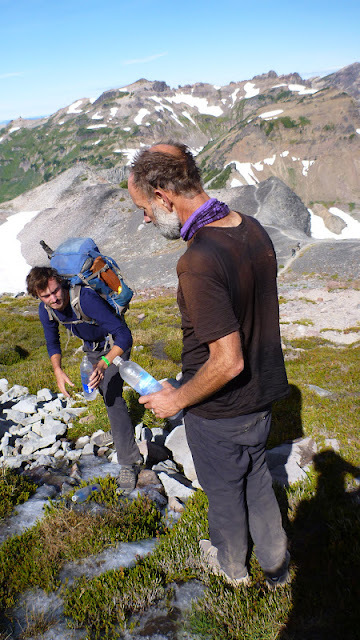 Seano took this photo of Dionysus and Pan hiking along the PCT with Mt. Adams in the background. Looking northwest toward Mt. Rainier, the most beautiful volcano of them all. Getting SUCH delicious water running down through the mountain heath. 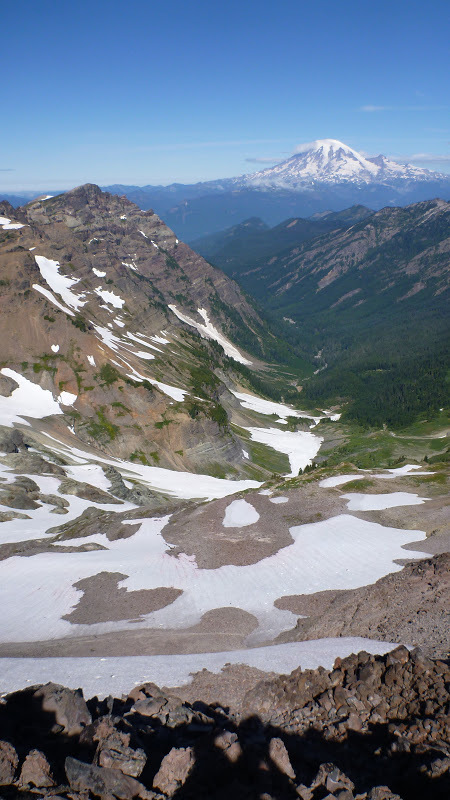 One of the many views in the Goat Rocks Wilderness. Seano snapped this photo as Dionysus and Pan headed down the PCT. From there, we were determined to reach White Pass and a bit of civilization there, this despite Pan rolling his ankle on a gravelly slope. But Dionysus was the big hero of the day. With time running out for us to reach the convenience store before it closed, he sprinted out ahead to get our resupply box and a night of eats before the clock struck 7. Ignore the snow in this map. It was green. We approached from the Goat Rocks in the upper right, and cut down a trail just under the Couloir Express ski lift furthest to the right, thinking we were on the right track. Nope. When we reached the "bottom" we still had half a mountain to go -- and had to follow a "Base Area Access" road through the trees connecting the two mountains and then onto "Main Street" -- a blue run heading down to the base. As fast as we were running, we never saw Dionysus anywhere ahead of us -- and we could see a long way. But he went the same way, the same route, and got to the store 30 min. ahead of us. Dionysos Soteros! 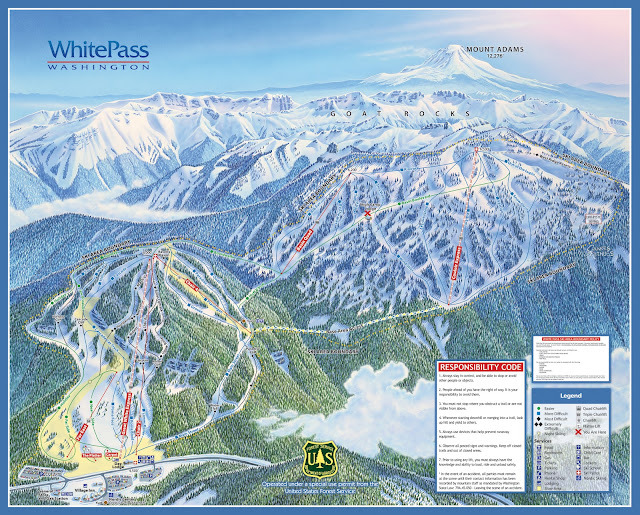 He cut down along the White Pass ski area thumping his legs mercilessly, arriving a full half hour before the doors closed, having busted out a 26-mile day. Pan and I stumbled in just before closing to pick up a couple more things then carry our stash of calories up the slope to the neighboring ski motel where we spent the night. Rustic! Dionysus and I stayed in the upper loft reached by a 10 foot ladder. Our poor feet were not happy about that, but our full stomachs went some way to make up for it.